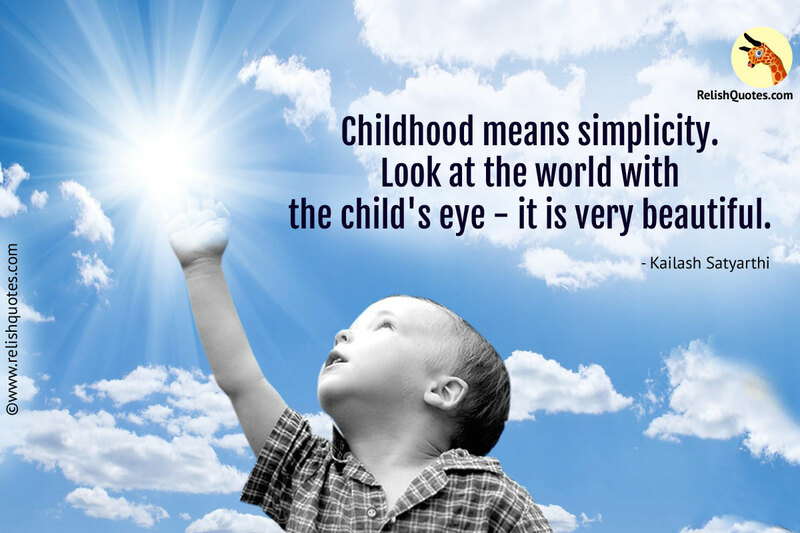 What does this Best Quote on childhood teaches us? Kailash Satyarthi, the fighter for the education and rights of Children, with this Best Quote, gives a new window to our minds to look through. Unadulterated, untouched, pure and untainted-words like these fall short to suffice the description of a child’s vision. Childhood is one such phase of life, wherein you have a mind of your own leading to a wholesome way of looking at the world. You see and create images and perceptions that are free of any bias. Children are the most non-judgemental beings on earth. The kind of opinion they have and give on things and people around the, is not stained with politics, strategies, estimations and beliefs. If you are looking for a true review on something, it is children that you should run to. The world through the eyes of a child is freedom in every move you make. Through the eyes of a child, the world is filled with the natural bounties of Nature in the form of crystal clear rivers, colourful and vibrant flowers and snow capped mountains. Children see and feel the world around them as one family. For everybody who speaks sweetly to them and gives them a cheerful look and smile, is a friend. For children, no one is bound by restrictions of boundaries and limitations of caste, creed, race, religion or color. For children, the world is not materialistic. The entire human race is considered and looked at as one big global family. The innocent eyes of children never see the mounting tension of the world as stress. They have their own little ways of dealing and doing things. Children have the most wildest of imagination, that is creative in its own way. In the eyes of children, the world is a beautiful place to live in, and we should learn a lesson to imbibe all these qualities and vision, like that of children for peaceful human existence.